There are about 20 different species of nematode parasites of sheep commonly found in the UK. Pathogenicity varies with species, the numbers of nematodoes present as well as host factors such as the age of the sheep (maturity), nutritional status and body condition. The life cycles of the gastrointestinal nematodes are all very similar, with one or two minor exceptions (for more information see the SCOPS Technical Manual). 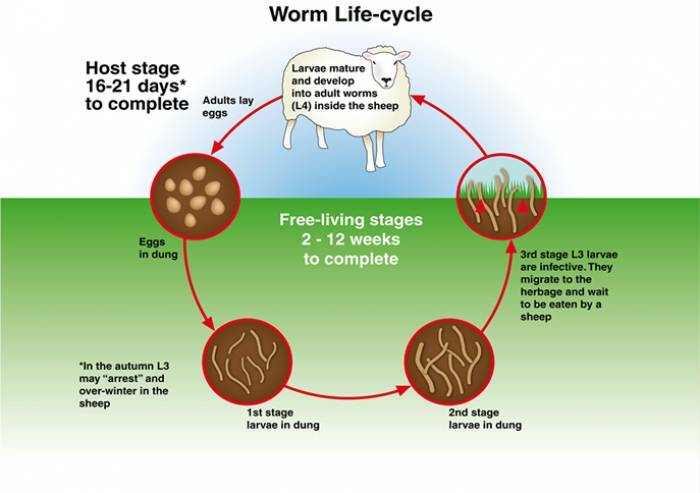 The worms do not multiply within the sheep and the lifecycle is direct (no intermediate host). Adult female worms in the sheep lay eggs that pass out in the dung and hatch, with each egg releasing one first-stage larva (L1). These L1s develop and moult to second stage larvae (L2) and both of these stages remain in the dung feeding on bacteria. At the second moult the third stage larvae (L3) appear and these are the ‘infective’ larvae that migrate onto the herbage where they are ingested by grazing sheep. Once ingested they enter the wall of the stomach or intestines and develop into fourth stage larvae (L4) and then, about 14 days later, mature into adult worms. The prepatent period (time between the L3s being eaten by the sheep and the appearance of eggs in the dung) is normally 16-21 days. Adult worms that are not expelled by the immune system of the sheep or killed by anthelmintics will die naturally after a short period (typically less than 12 weeks). Anthlemintics are an essential tool to control worm populations in sheep and, left unchecked, anthelmintic resistance is one of the biggest challenges to the future health and profitability of the UK sheep industry. Navigate the website to learn more. Download a table of important UK worm species.